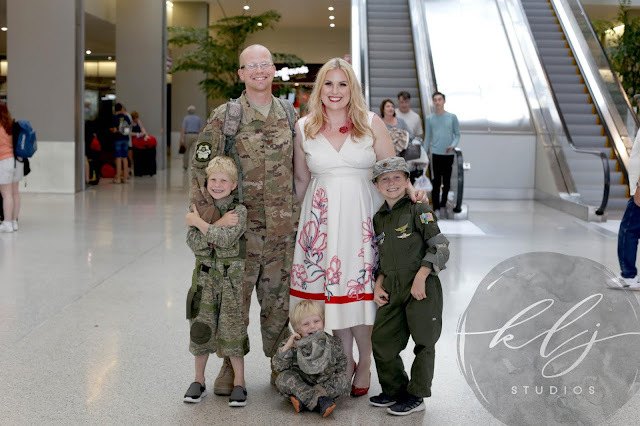 On the afternoon of Friday, July 20th, 2018, KLJ Studios Photography was given a special opportunity to photograph an On-Location Family Portrait Session for a Military Homecoming in Sacramento, California at the Sacramento International Airport (SMF). 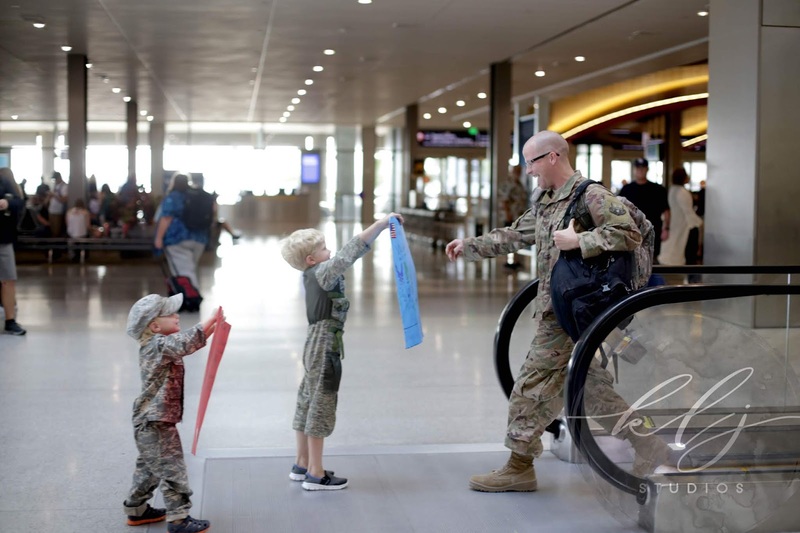 The Military Homecoming was of Austin (United States Airforce) returning home to his wife, Jennifer, and three sons, Jefferson, Jackson, and Joshua. 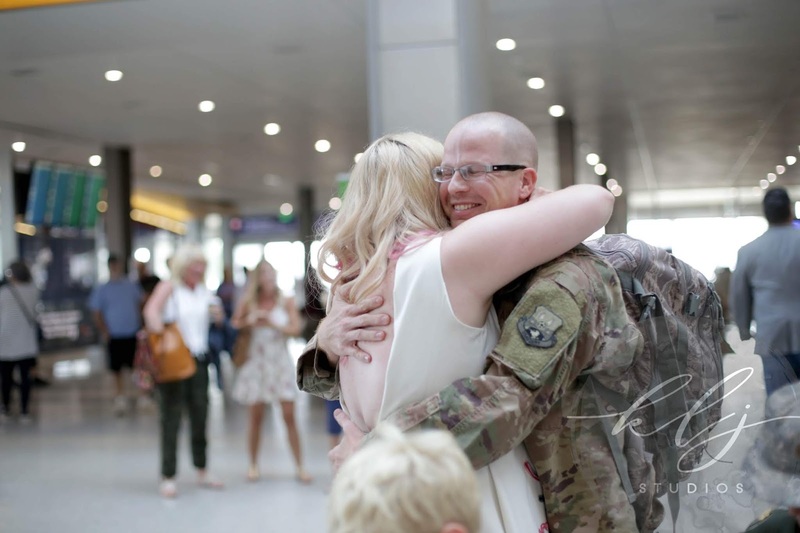 Austin had been deployed was for 6.5 months, and Jennifer booked the session to capture the special moment of Austin returning home. The Lead Photographer for the KLJ Portrait Session was KLJ Studios Lead Portrait Photographer, Kelly Lynn Jordan. The KLJ Studios Second-Shooter was Aimee Wallace, and the KLJ Beauty Studios Makeup Artist was Veronica Marshall. 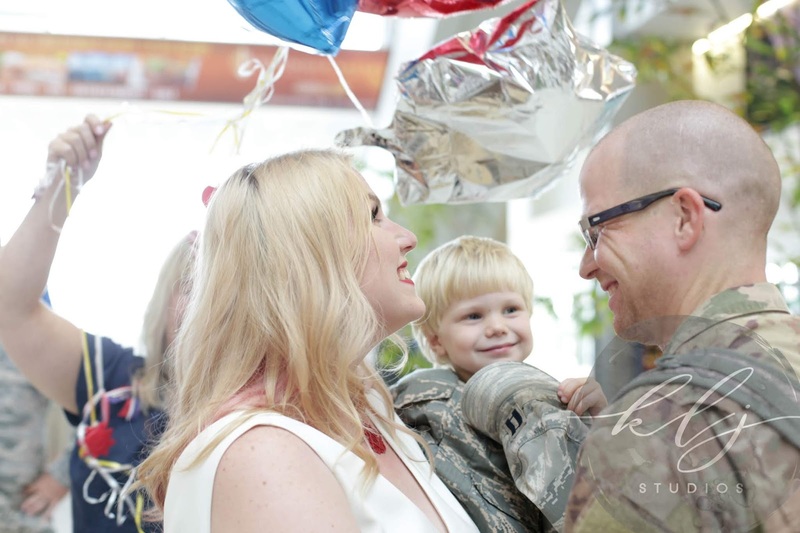 With clothing ready to go, a beautiful dress, and military outfits for the kids, the day started with Jennifer getting her nails ready. At the salon, once people realized why Jennifer was there getting her nails done, everyone at the salon pooled their money and paid for Jennifer’s beauty treatment! Jennifer then came to KLJ Studios to get her makeup and hair prepared at the KLJ Studios Beauty Studio by Makeup Artist Veronica Marshall. Veronica did a beautiful job on the makeup (as always) and when we told Veronica this, she replied, “It makes it easy when you start with a beautiful client.” Jennifer looked stunning. The moment was set, Jennifer and the three boys, Jefferson, Jackson, and Joshua, were all gathered with hand-made signs to wait on their father Austin to come down the airport’s escalator to baggage claim. The boys waited anxiously and were unable to stand still the entire time. 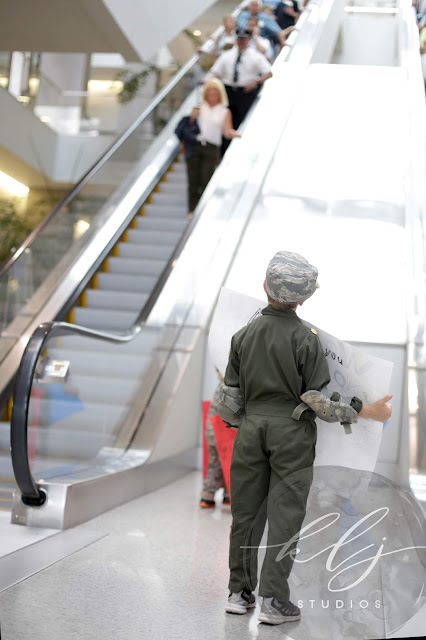 Whenever the boys saw someone coming down the escalator they would run over as quickly as possible, and once they discovered it was not their dad, a look of great sadness would appear. They did this several times. We learned that Jefferson loves to collect military patches; he really looks up to his father. KLJ Studios of Northern California (KLJ Photography Studio and KLJ Beauty Studio) is located in Yolo County at 424 1st Street in Historic Downtown Woodland, California. To inquire about our photography and beauty services in Norther California please call our Northern California Studios at 530.723.5332, or send an email to [email protected]; please include your name, the best method for reaching you, where you are located, and a message detailing your needs.